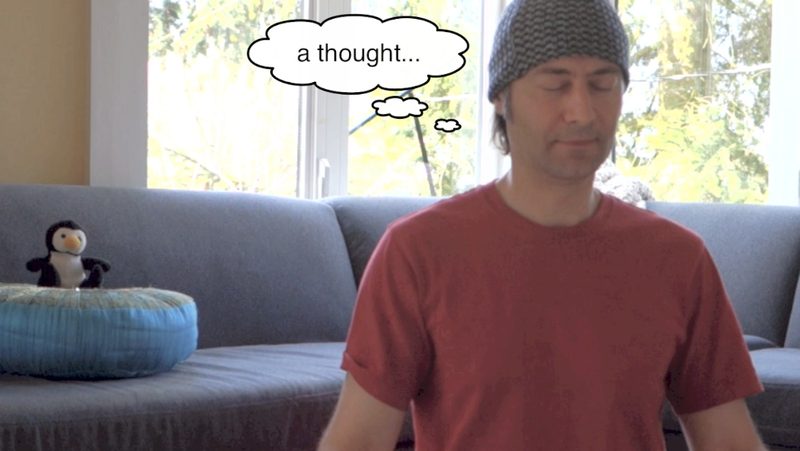 In the past, I’ve posted about some common misconceptions about thinking and meditation and even created a three-part video series about how to be mindful of thoughts: Part 1, Part 2 and Part 3. But because it’s such a common concern and source of misunderstanding, I thought I’d share some more tips and techniques to help you get past feeling frustrated about all those thoughts and show you how to work with them more productively during your meditation sessions. If you’re reading this, you’ve probably already had that “a-ha” moment where you sit down to do your meditation and become aware, perhaps for the first time in your life, just how “active” the mind is! Let me assure you that this is completely normal and expected mental activity! While there are many styles of meditation, each with their own particular techniques and objectives, all of them can be more effectively practiced when you have some understanding of the nature of your mind and what to do about all that incessant mental activity. And that’s where my first tip for you starts: with some information to help you shift from having an antagonistic relationship with thoughts, to being able to constructively work with them during meditation. It’s really important avoid the trap of being at war with your own mind! Thoughts are not evil or bad or even unwanted. Thinking is a natural activity of mind and an extremely useful activity! 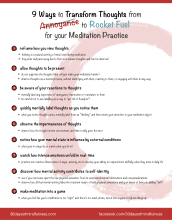 If you’d like to download a one-page PDF that summarizes the tips and techniques from this blog post, as well as a collection of Guided Meditations to help you practice Tips #1 to 5, then Sign Up for my Weekly Blog Updates (Click Here). Allow the thoughts to be present in your awareness as you meditate. Do nothing to suppress or repress them! Instead, when the thoughts become predominant (in other words, when your attention is taken up by the thoughts more than by your meditation object), switch your focus momentarily to the thoughts themselves. Observe the thoughts as a mental process, without identifying with them, reacting to them, or engaging with them in any way. To help you do this, just quietly mentally label this process as “thinking”, until you notice that the thoughts are no longer predominant. Once this occurs, return your attention back to your meditation object (such as the physical sensations associated with breathing). It’s important to understand that this mental labeling is meant to help you more clearly notice the process of thinking in an objective way. It’s not meant as a tool to “get rid of thoughts”! Notice any tendency you have to push the thoughts away. Notice any feelings of disappointment or frustration that arise when you want to have a peaceful, relaxing, “clear” meditation, and thoughts keep appearing and “disturbing” you. Notice the feelings of frustration! It can be very helpful to mentally label your reactions to noticing thoughts during meditation with whatever word seems appropriate to you at the time: “resisting”, “disappointment”, “frustration”, “aversion”, etc. If you’re using the Noting Technique and are relatively new to this practice, you may find it challenging enough just to note the rising and falling sensations at the abdomen. If that’s the case, keep your mental labeling of thoughts very brief. Mentally label “rising”, “falling” and when you become aware of a thought arising, just label it as “thinking” and then return your attention back to the abdomen and continue labeling “rising” and “falling”. You will probably find that quickly labeling thoughts as soon as you notice them arise will help you to more easily maintain your attention on the physical sensations of the abdomen. Well, in order to answer that question, it’s helpful to take a closer look at what’s going on when you’re engaged in Noting Practice. 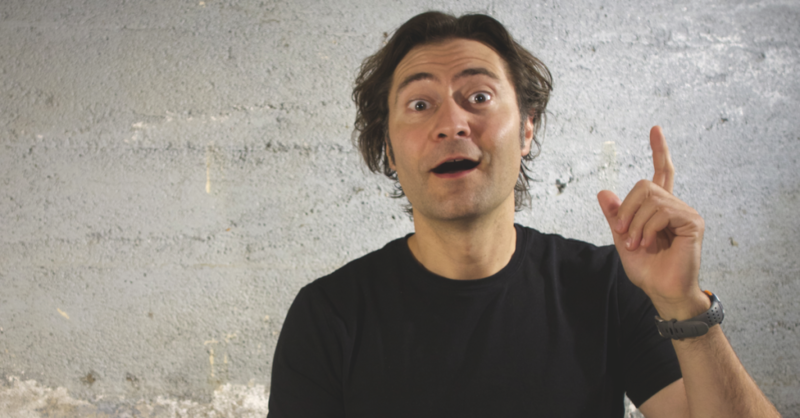 Let me walk you through a couple of quick examples to show you why mental labeling of thoughts works so much better than trying to forcefully suppress them. You settle into your posture, take a few deep breaths, and then get into it. You focus your attention on the physical sensations of breathing that occur in the abdominal area. When you feel the abdomen expand on the inbreath, you label those sensations as “rising”. Then the feeling of expansion stops, perhaps followed by a slight pause, and then you notice the sensations associated with the contraction of the abdomen, so you label them as “falling”. Then there may be another pause, followed by the sensations of expansion again, which you label as “rising”. You make an effort to catch the very first physical sensation that tells you the abdomen is expanding and label that as “rising.” And similarly for the sensations of contraction on the outbreath. After a few rounds of “rising” and “falling”, you often start to notice thoughts arising in your awareness. You notice the thoughts, but you don’t label them. Instead, you kind of mentally (and even physically) contract a bit to push the thoughts away. After all, you don’t want no stinkin’ thoughts! You keep labeling “rising” and “falling” and then suddenly, you lose your object. Then you suddenly “come to” and realize what happened. So you contract a bit more, force those thoughts out, and redouble your efforts to pay attention to the physical sensations of breathing. And because your attention is focused even more strongly than before on the physical sensations of breathing, you’re even less aware of other things, such as thoughts, as they arise in the mind. 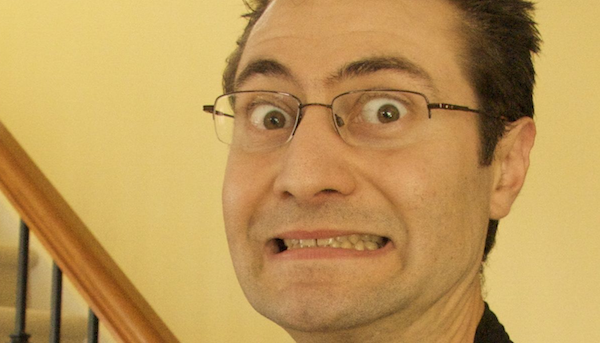 So, it’s no surprise when another one sneaks up on you. Before you know it, you’re in La La Land again, flying to Peru and trekking the Inca Trail to Machu Picchu. You never even saw the thought coming! Clearly, attempting to suppress thoughts and make your attention super-focused is not the answer. You’re doing your usual “rising” and “falling” labeling, when you notice some thoughts arising in your awareness. As soon as you recognize that a thought is present, you label it as “thinking” and then return to the physical sensations of breathing. Thoughts move really fast, so by the time you’re back at “rising”, that initial thought has already come and gone. Another thought arises just as you finish labeling “falling” and so you quickly catch it and label it, “thinking”. And this happens over and over, throughout your meditation session. You notice that getting carried away by the thought happens much less frequently. Because, once you label the thought, you objectify it. It’s just another mental event. Objectifying the process of thinking in this way is a form of non-reactive observation. You allow the thought to be present, without identifying with it or engaging with it in any way. And you’re clearly aware of its presence. You aren’t ignoring it at all. You’re just not making a big deal out of it. Because you’re clearly aware of the thought, but you don’t mess with it in any way, the thought can merrily go and do what thoughts do: arise, remain for a very brief moment, and then pass away. And because you noticed the thought with enough clarity and precision to label it, you aren’t caught by surprise. The thought can’t sweep out of nowhere and capture your attention with it’s seductive content. And notice, all you did was label the thought as “thinking”. You completely disregarded it’s content. It could have been a thought as mundane as what you’ll have for dinner tonight, or as profound as the relationship between consciousness, enlightenment and the nature of the universe. It doesn’t matter. “Thinking”. Done. All thoughts get the same treatment. And you treat them as just as important, and with the same level of attention, as “rising” and “falling”. Thoughts are not second class citizens in your meditation practice. If you find it pretty easy to notice and label “rising”, “falling” and “thinking”, without straining, then you can work with thoughts more comprehensively. You can get to know them more intimately. And one of the coolest things to notice about thoughts is their impermanent nature. I know, I know, that’s obvious! But there’s nothing quite like experiencing this in deep meditation with a fully alert mind. Tuning in to the impermanent nature of thoughts and really grokking this can be a real shocker – in a good way! A deep observation of impermanence is the gateway to insights that can radically transform your subjective experience of things like stress, anxiety, intense emotions and so on. In a way that intellectual understanding simply can’t. Now, it’s easy to mistakenly believe that we are our thoughts. Or that we are the thinker that is thinking all these thoughts. Well, it just ain’t so. And you can realize this yourself if you take a closer look at their arising and passing away. I’ll have more to say about this in Tip #8. Go and watch a really intense, violent movie. I don’t know, something like The Godfather. Or if that’s too graphic for you, try something that’s still dramatic but less intense, such as an episode of the TV Series Cosmos (my kids are loving this series and keep re-watching their favorite episodes, so I had to mention it here =) ). After you’ve done that, sit down and meditate, and watch what thoughts come up. Funny how, before watching that movie, you didn’t often have images of drive by shootings, or rotating galaxies and supernovas, when you sat down to meditate. And now your mind is full of that stuff. You can do the same experiment using a really catchy tune. Play some top 40 Hip Hop songs a few times and then meditate. Now you’ve got a background score for all the “rising”, “falling” and “thinking”. These experiments should convince you of how easily external events can influence your mental activity. And it doesn’t just apply to these kinds of obvious scenarios. It’s similar for more subtle things. Like telling a white lie. Or cutting someone off in traffic. Or saying an unkind word. These things provide the causes and conditions for the future arising of mental activity that can be pretty unpleasant. Once something goes in, it stays in. So be careful about what you allow in there! Of course, this also works with things like saying a kind word to someone. Being patient instead of getting upset. Letting that stressed out Mom in the mini van who’s kids are late for school cut in front of you. These sorts of actions plant seeds that provide the conditions for the arising of another kind of mental activity: the kind that sees the glass as half full rather than half empty, that sees opportunities instead of obstacles. But, all this is arm-waving woo-woo talk, until you actually check it out for yourself. So don’t take my word for it. Do the experiment and draw your own conclusions. Once you’re pretty solid at non-reactively observing your thoughts, it can be very instructive to have a good look at more challenging mind states, such as anger, anxiety, intense desire or craving, and so on. Watch how they first appear in your conscious awareness. I don’t know why, but to me they always seem like tiny brussels sprouts when they first arise. Notice how they grow in size and energy, and how they condition the arising of thoughts, mental images and physical sensations. 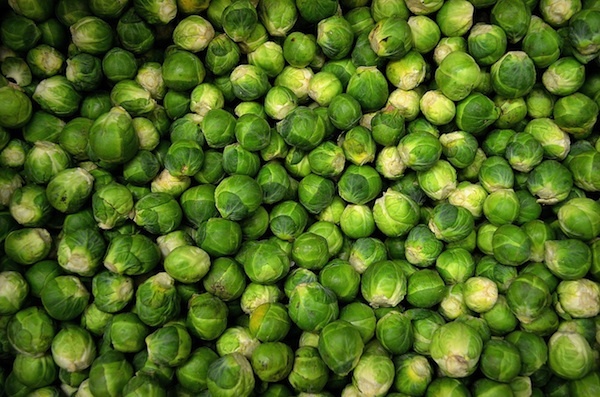 Watch all the feedback loops: how resisting the arising thoughts or sensations makes the angry brussels sprout get even larger and more powerful, which spins off even more thoughts and physical sensations. It’s easy to get overwhelmed by these kinds of intense mental states. So keep your cool and whenever you need a breather to calm down, put your attention on something neutral, like the physical sensations of the breath at the abdomen. Once you’ve recovered, you can go back and observe the anger, or whatever it is, more closely again. After you’ve done this enough times, you’ll realize that the highly uncomfortable mental and physical agitation that goes along with these intense mental states is what compels you to react so strongly to them. And you’ll get some first hand experience that extended, non-reactive observation of that unpleasantness (there’s that mindfulness again) causes the mental agitation to be gradually reduced and eventually eliminated. This is something that students in my 30 Days of Mindfulness Course spend a lot of time on. It’s an essential thing to practice if you want to be able to handle these kinds of intense mental states more skillfully in daily life. 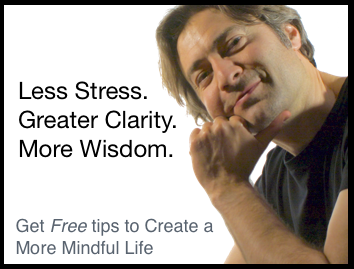 Most people are drawn to mindfulness and meditation as a way to relax, reduce stress and function better in daily life. For them, the first seven tips are plenty. But some people want to go deeper. They’re interested in using mindfulness as a path for spiritual development. If that sounds like you, here’s some tips for working with thoughts that gets to the very heart of the matter. Thoughts are a very important support for the construction of a sense of identity. When your mind is relatively stable, and you can consistently observe thoughts without getting lost in their content, it can be very illuminating to have a careful look at the role thoughts play in the fabrication of the sense that there’s someone ‘in here’ that’s observing, thinking and interacting with the world ‘out there’. One of the ways that thoughts do this is by maintaining the illusion of the continuity of the sense of self. For example, you experience the sensations of stretching and pressure in the abdominal area as you inhale. At the same time, you may also have a mental image of your abdomen moving and various cognitive evaluations of that movement. Through careful, mindful observation of this process of sensation overlaid with cognitive evaluation, it’s possible to tease apart the raw sense data from all the mental activity about it. And when you do this, you may notice that the raw physical sensations, which until now you had always assumed to be continuous, are actually absent much of the time. What’s happening is that raw sense data arise and pass away rapidly in little chunks, with gaps in between the passing away of one chunk and the arising of another. Some of those gaps can be quite long, relatively speaking, but normally you don’t notice this because all that mental processing about the sense data fills them in, giving the illusion of continuity. It’s easy to mistakenly assume that the breath is an aspect of yourself. That it’s you who is doing the breathing. The illusion of continuity makes it seem like there’s a self (you) that’s sitting on the meditation cushion inhaling and exhaling. But when you experience the breakdown of that continuity, the belief in that abiding, separate self is no longer as tenable. Your sense of identity starts to feel like it’s built on some pretty shaky foundations! When you have this kind of experience, you’re beginning to enter into the land of insight meditation, or vipassana. This is the doorway to the freedom from suffering that the Buddha taught over 2500 years ago. And it can be a scary thing if you’re not ready for it and you don’t have a teacher who knows this territory well and can help guide you through it. But, with the right supports in place, this form of practice can be an incredible adventure of discovery, which pretty much upends everything you think you are, and leads to a radical transformation of your subjective experience. 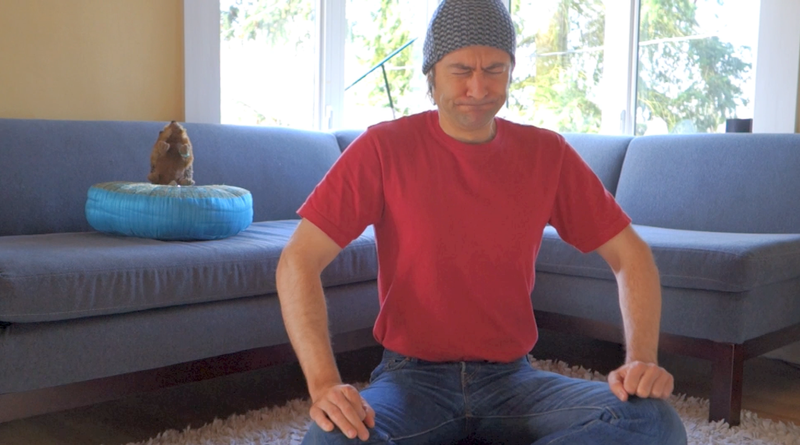 Now, after reading some of these tips and trying them out, you may find you’re feeling a little “tight” while meditating. Like you’re straining. After all, thoughts are fast, slippery little buggers. You really need to be on your game if you’re going to catch them before they catch you! Here’s a way to lighten things up a bit, while making it easier to be aware of both thoughts and the physical sensations of rising and falling. 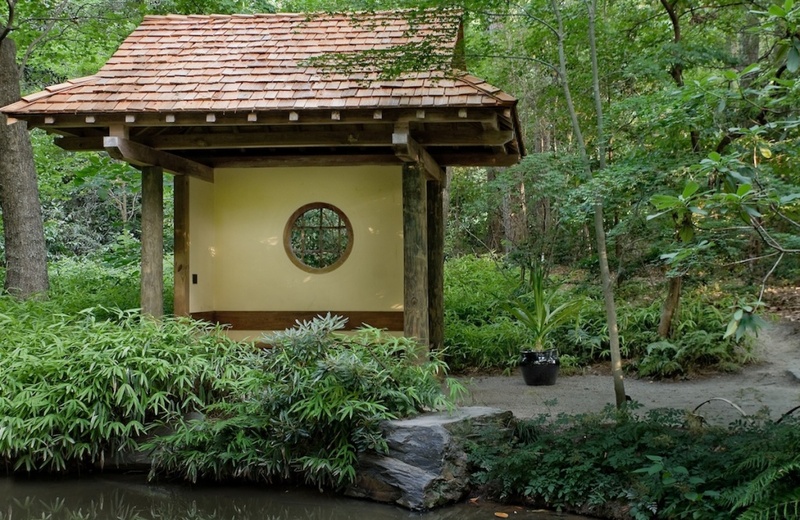 Meditation does not need to feel like drudgery or thankless work. It can be fun and engaging! 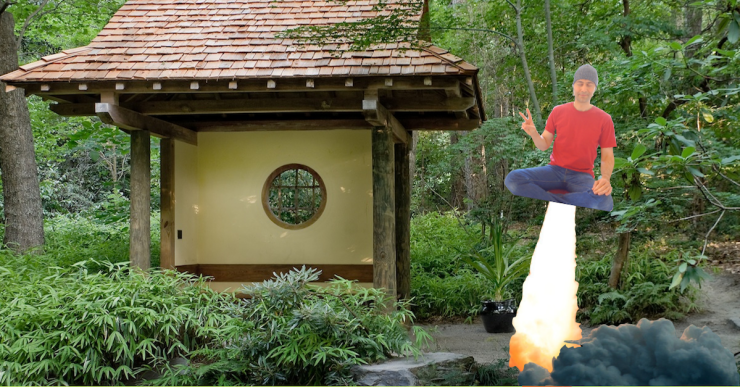 Treat your meditation practice like a game of Whac-A-Mole. Instead of plastic moles, you have physical sensations, thoughts, sounds, and so on. Keep it light and fun and treat it like a game. Keep trying to improve your “score” by noticing and labeling as many sensations and thoughts as you can. Just like with the Whac-A-Mole game, you know you won’t be able to get every one of them when you’re new to the game, so have fun with it and don’t stress over the missed ones. But after some practice, you can get really good at it! Hi, I have been meditating for about 6 years daily but I still haven’t grasped this concept about the illusion of continuity. 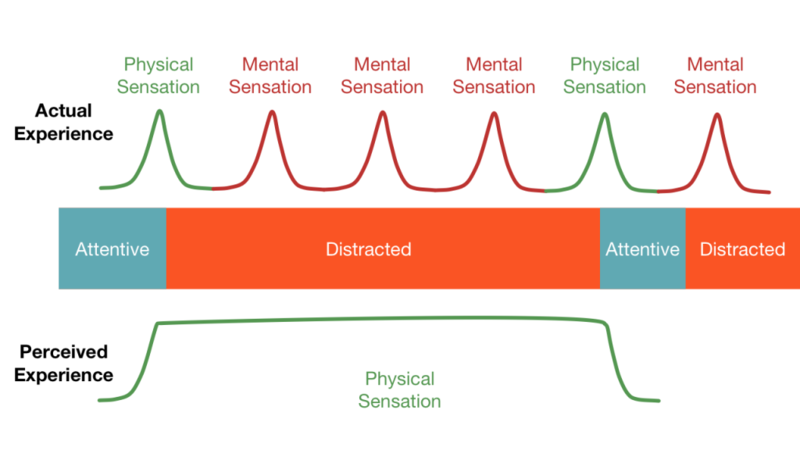 It kind of seems obvious to me that the sensations aren’t happening all the time. One moment theres an itch then there isn’t, one moment i has a pain then its gone etc. Maybe I’m misunderstanding what you’re saying in which case could you please help me to understand this better?